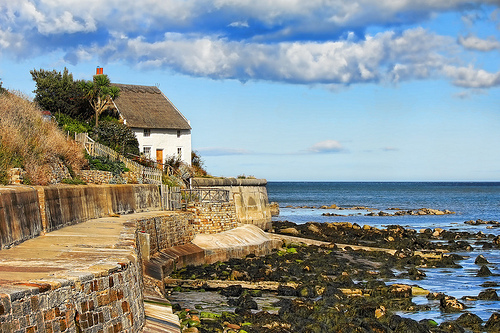 Runswick Bay is a pretty little village on the scenic North Yorkshire coast. This largely undiscovered little gem of a place lies a few miles north of the historic town of Whitby, tucked away in a sheltered cove. It is only a small village, but what it lacks in size it more than makes up for in quaint charm. Runswick Bay is a traditional fishing village and today not much has changed. Charming cottages are huddled together, intersected by narrow footpaths that eventually head out of the village and join the ancient Cleveland Way, a scenic coastal footpath running the length and breadth of the Yorkshire coastline. Visitors can arrive by car – there are two car parks in the village – or on foot from Whitby. On a hot summer’s day, the village is packed with visitors, but even on a chilly winter’s afternoon, it is still a wonderful place to visit and enjoy a home-made cake and cup of tea, whilst enjoying the spectacular views. Most people visit Runswick Bay to enjoy the local scenery. The village is located on one of the most stunning stretches of the North Yorkshire coastline and the beach is superb. Runswick Bay is sheltered by the majestic Lingrow Knowle, so even when gales are raging and the rest of the towns and villages along this stretch of coast are being battered by strong winds, Runswick Bay is a quiet and calm oasis. You can explore Runswick Bay on foot quite easily. Some of the footpaths are quite steep, but the village is largely car-free and therefore very safe for families with small children. The beach is great all year round. In the winter it is popular with dog walkers, but in summer it makes a lovely sheltered place for a picnic. Play games on the sand, paddle in the sea, hunt for crabs in rock pools at low tide, and look for fossils along the edge of the cliff. And when you need some refreshments, buy an ice cream or sample some delicious home-made cakes from the quaint little café. The old coastguard’s cottage is a reminder of village life back in the days when the fishing industry was the primary source of local revenue. The deserted RNLI lifeboat station is another reminder of the area’s naval heritage. Other village attractions include the Methodist Church and village spring. The coastal footpath climbs out of Runswick Bay: put your walking shoes on and take a camera for there are some fantastic views to admire. Sailing enthusiasts should head to the Runswick Bay Sailing Club. There are also plenty of opportunities for surfing when the waves are high. Just up from the beach lies the only pub in the village, but if you fancy a pint in a dog-friendly hostelry, this is the place to be. Since Runswick Bay is right in the heart of the North Yorkshire Moors, you don’t have to drive far to find areas of outstanding natural beauty. Whitby is only a short drive away, but on a nice day, the walk is breath taking.